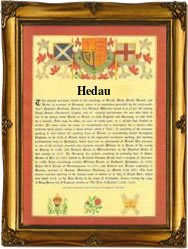 Recorded as Hedau, Hedaux, Hede, Hedde, Hedou, Hedin, Hedon, Hedman and others, this is a surname of French origins, of which it has at least two. The first is one from a large group which descend from an early Germanic personal name 'Haido or Hadu' meaning battle. Names which include elements describing battle, counsel, honour and religion, were very popular during the period of history known as 'The Dark Ages'. This was from the fall of the Roman Empire in the 5th century until at least the coming of the Emperor Charlemagne of Gall-France in the 8th century. Most of these early names were ultimately swamped by the later 12th century Crusader Christian names, so this is a 'pagan' survivor. The second possible origin is locational or topographical either from a place called Hede, in English Heath, or from living on a moor or waste land. The majority of early French regietsre were destroyed in the confusion surrounding the Revolution of 1792, when the church itself was banned for a decade. In this case surviving examples include Jean Hedde who married Gabrielle Perrot at St Germain en Laye, Seine-et-Loise, on September 5th 1719, and Jean Hedau and his wife Jeanne Louis, christening witnesses at Lagnet, Meurthe-et-Moselle, on February 28th 1742.